We are offering you a complete choice of products which include Turck Field Bus Accessories such as Field Bus System and Field Bus Accessories. We are the supplier of a wide range of Fieldbus Accessories. A solution for every field bus We offer PROFIBUS-PA or FOUNDATION™ field bus devices for process automation applications. You want to implement tailor made solutions. Use our remote I/O system excom® for intrinsically-safe PROFIBUS-DP applications. We also offer a comprehensive product range for factory automation applications. Our modular and compact I/O stations in IP20 resp. IP67 are suited for all conventional bus systems such as PROFIBUS-DP, Device Net™, CANopen, INTERBUS, AS-Interface or Ethernet based protocols like PROFI NET, Ether Net/IP™ and Modbus TCP. We are offering Field Bus Cable. 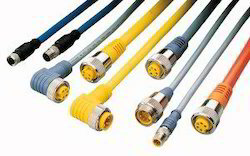 TURCK offers the full range of components needed to build a complete fieldbus network, such as fieldbus cables, repeaters and many accessories. Moreover, bus and power cables, passive and active junction boxes, cabinet feed-throughs and mounting flanges. Pre-assembled connectors and terminating resistors round off the product line.